Will Los Angeles public school teachers go on strike? It has been nearly two months since the city’s teachers’ union overwhelmingly voted in favor of one. 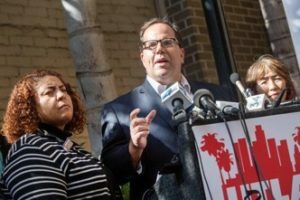 Since then, district officials and the union, United Teachers Los Angeles, had three negotiating sessions with a state mediator and are not any closer to an agreement than when they began. Now, with the failed mediation behind them, they are in the midst of independent “fact-finding,” which will give an analysis of the financial state of the district. School officials all over the district are readying for what many believe is an inevitable strike, this week sending parents a guide to prepare. Under state law, the union cannot strike until after the financial analysis is completed — a process that will last several weeks. But union leaders have repeatedly said that the contract talks, which have already gone on for 18 months and stalled again in July, have dramatically disintegrated. Alex Caputo-Pearl, the union’s president, seems ready to call for the first teacher strike in Los Angeles in nearly 30 years. Union officials have been particularly incensed in the months since Austin Beutner, a former investment banker, took over as superintendent. Mr. Beutner and members of the school board say that the district would go broke if it accepted what the union called its “last, best and final” offer. But the union, which represents more than 30,000 teachers, counselors, social workers, nurses and librarians, contend that Mr. Beutner is exaggerating and simply wants a cheaper deal. By some estimates, the two sides are nearly $3 billion apart over salaries, class sizes and the number of children assigned to social workers, nurses and counselors. “What we have here is a conflict over diametrically opposed positions: Our idea is to reinvest in public schools, and their goal is to downsize and close schools,” Mr. Caputo-Pearl said in a recent interview. Not surprisingly, Mr. Beutner had a different take.